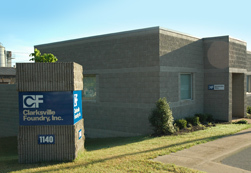 The Foust family has owned Clarksville Foundry for more than 100 years. Charlie Foust receives the Ovation Award on behalf of Clarksville Foundry from Austin Peay Center of Excellence for Creative Arts. 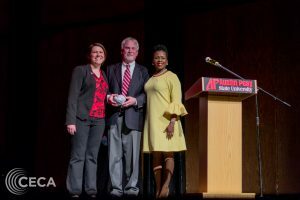 CECA Director Janice Crews and CECA Board Member Kimberly Wiggins (right) present the Ovation Award in Business on April 8, during a ceremony at Austin Peay State University’s George and Sharon Mabry Concert Hall. Clarksville Foundry produces more than industrial “widgets,” as President Charles Foust Jr. refers to the majority of the company’s casting work. In fact, the Foundry is a valuable resource for artists both near and far. From the “Rosette Bobbin” and “Window to the World” sculpted by Vaughn Randall, to “Patterns of Progress” by Tom Malone and others, these pieces blend iron casting and art. It is this appreciation and advancement of the arts that sets Clarksville Foundry apart from many other businesses. 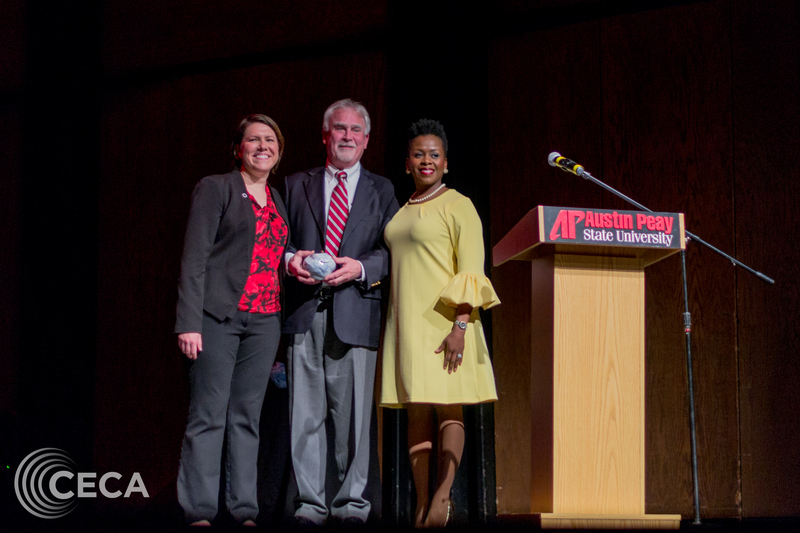 As such, Austin Peay State University’s Center for Excellence for the Creative Arts (CECA) recently awarded the Foundry the 2018 Ovation Award for Business during a ceremony, April 8. “The Foundry is a part of the historical fabric of Clarksville since 1847 and has made many cast metal works of art that you see around our beautiful city of Clarksville,” said Kimberly Wiggins, CECA Advisory Board member, and local small business owner. The Clarksville-Montgomery County Arts & Heritage Development Council submitted the Foundry for this prestigious honor because of Foust’s strong support of public art in the community. This support often manifests in different ways, ranging from a sculptor approaching Foust with a project or the Foundry president approaching an artist with an idea. “From Tom Malone’s ‘Patterns of Progress’ wall sculpture that greets public library patrons, to the massive iron wheel that stands in front of the Foundry, to the 8-foot in diameter sphere that will enhance the Downtown Commons, the Foundry has added to Clarksville’s public art inventory in significant ways,” the nomination reads. The ceremony recognized eight Ovation Award recipients and featured art and performances by musical, dance and theater groups. Being named an Ovation Award winner is “a real honor,” Foust said. Not only for his family, but also for the Foundry employees, who work together to cast the components for many art pieces. Jim Diehr, recipient of the 2018 Ovation Award in the Category of Individual Artist, also frequently partners with Clarksville Foundry. Other distinguished artists working with the Foundry through the years include Miranda Herrick, Kit Reuther, Olen Bryant, Alan LeQuire and Mike Andrews, among others. CECA’s mission is to support and provide opportunities within the creative arts for Austin Peay students, the Clarksville community and the greater middle Tennessee region. The Ovation Awards recognize the dedication of individuals and organizations to building and sustaining arts and culture in Montgomery County. “The Ovation Awards recognize accomplished artists and organizations that make a difference in our community through the arts, but they’re also meant to inspire young artists to pursue their passion,” said CECA Director Dr. Janice Crews. Click play below to view the CECA-produced video featuring more about Clarksville Foundry’s support for local arts.